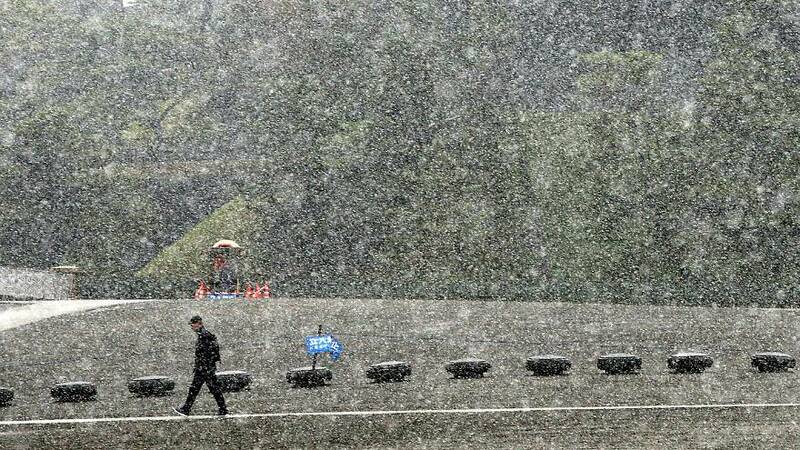 Tokyo has been hit by its first November snowfall in 54 years. The Japanese capital does see snow at least once a year, it usually falls in January or February and rarely accumulates for long. As much as two cm of snow was predicted for central Tokyo, according to the Japanese Meteorological Agency. The snow began as sleet around dawn, but turned to snow soon afterwards. It was sparked by an unusual cold front spreading over the Tokyo area that sent temperatures plunging to near zero C (32 F). Average temperatures at this time of year are highs of 14 C (57 F). They rose as far as 20 C (68 F) on Sunday. “The weather forecast did say it would snow, but I was sceptical since it is still November,” – commuter Chieko Odo.